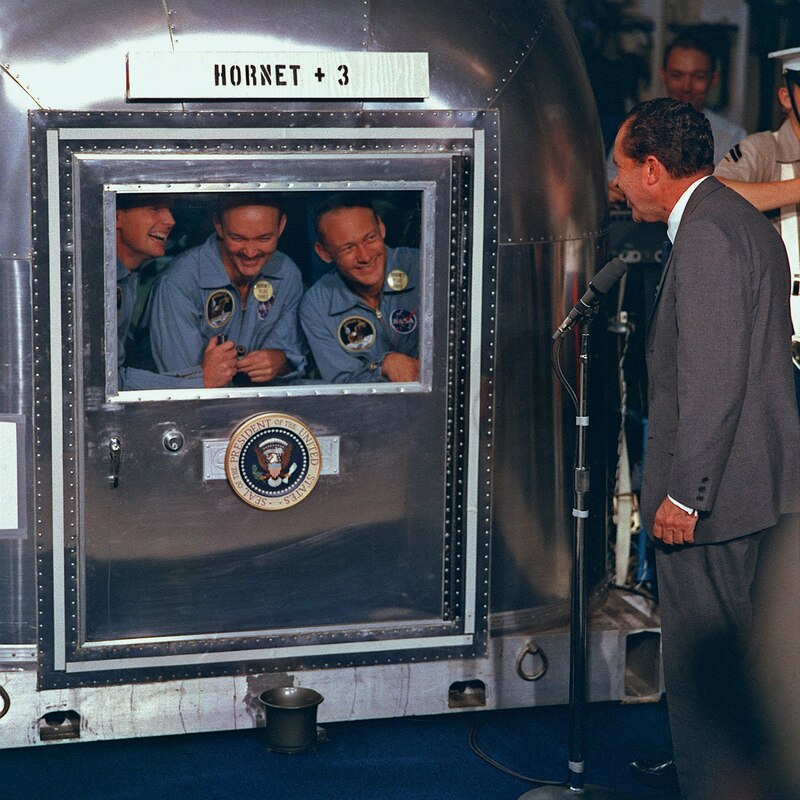 Anyone old enough to remember July 24, 1969—the day Apollo 11 safely splashed down in the Pacific to end their lunar landing mission—can probably remember what happened next: NASA quarantined the Apollo 11 astronauts. 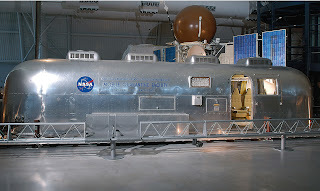 Fearing that they might have been infected by “moon germs” and protecting against a worst-case scenario, they put the Apollo crew in their Mobile Quarantine Facility (MQF) immediately after they splashed down. Converted from an Airstream trailer, the MQF contained living and sleeping quarters, a kitchen, and a bathroom. By keeping the air pressure inside the facility lower than the pressure outside, and by filtering the air before it was vented out, quarantine was assured. They remained in it while they were flown from the aircraft carrier U.S.S. Hornet to Honolulu and then lifted by crane into another plane and flown to the Johnson Space Center in Houston where the MQF was hooked up to a larger living space, the Lunar Receiving Laboratory. Only after scientists were sure they were not infected with any contagions were they allowed to emerge, 65 hours later. Lesser known, though, is that on their way to Houston, customs inspectors at the Honolulu airport had a little fun with Armstrong, Aldrin and Collins. 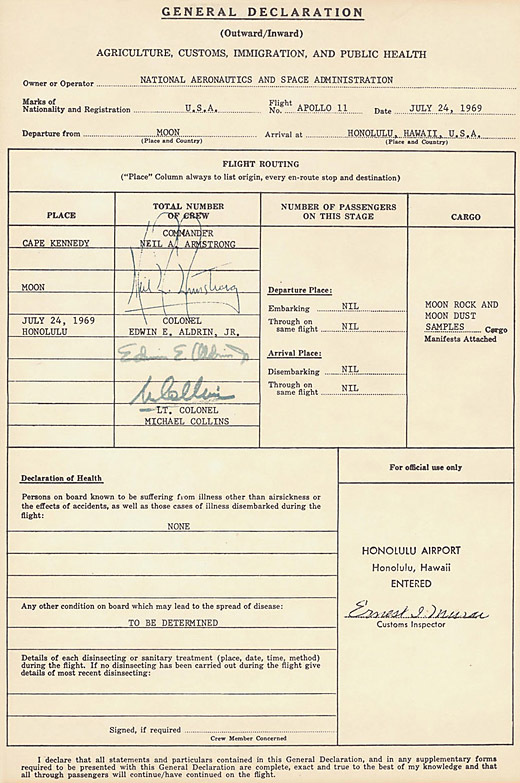 They filled out a General Declaration form for the astronauts, recording their trip from Cape Kennedy to the Moon and back to Hawaii. Under the cargo category, the form lists “MOON ROCK AND MOON DUST SAMPLES” and after “Any other condition on board which may lead to the spread of disease,” they entered “TO BE DETERMINED”(!) The form was duly signed by Commander Neil A. Armstrong, Colonel Edwin E. Aldrin Jr. and Lt. Colonel Michael Collins. Aldrin and Michael Collins after their return to Earth on July 24, 1969. Much has changed in the 42 years since that historic mission, and it’s hard to believe that we’ve not returned to the Moon in almost four decades. 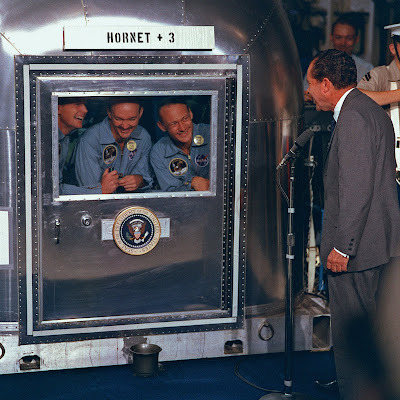 Richard Nixon, who famously welcomed the astronauts back to Earth from outside the Mobile Quarantine Facility onboard the U.S.S. Hornet is no longer with us, and all three astronauts are now in their 80s. 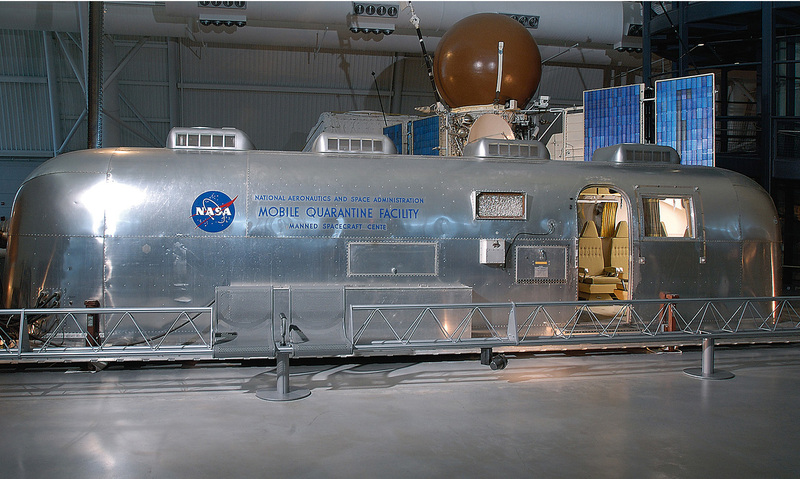 For anyone interested, the Mobile Quarantine Facility is now on display at the Smithsonian National Air and Space Museum. There will be no quiz this week as a nod to spring break. the Mobile Quarantine Facility onboard the U.S.S. Hornet.